What better place to indulge in luxurious comfort than a master bathroom. Today’s master bath designs combine the relaxing elegance of a spa with the function and features that best suit modern-day life. Whether your personal style is contemporary, traditional or eclectic, there are basic bathroom design elements to consider before renovating your master bath. The overall layout of a master bath requires thinking about some of the most personal aspects of how you want to live. If two people are sharing the bathroom, you may want a private space for the lavatory, separate sinks and plenty of drying space. Is there room for a large shower and a separate tub? How much storage space do you need for towels and toiletries? The design of this master bath by Boston interior designer, Elizabeth Swartz ASID, includes separate his and hers vanities. Providing space for this couple’s busy mornings as well as added storage. The new shower and vanities are placed in close proximity to accommodate plumbing constraints. The beautiful new soaking tub remained centered on the bay of windows, which provide natural light, creating a spa-like feeling. 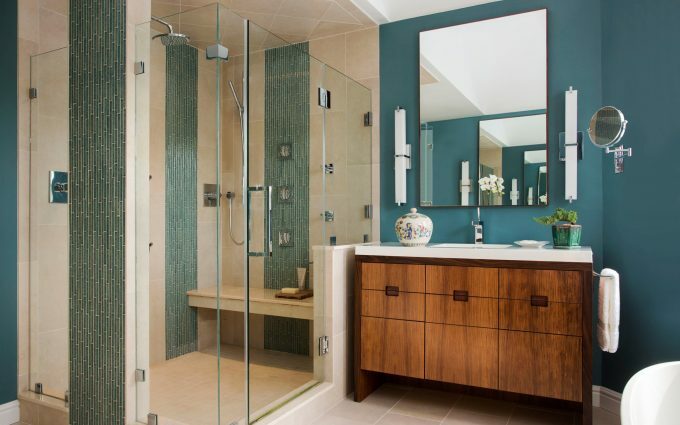 If your master bathroom is adjacent to your master bedroom, Boston interior designer Elizabeth Swartz, ASID, suggests coordinating the colors and materials. In this Beverly, Massachusetts master bathroom, we chose clean contemporary lines balanced with the warmth of custom Indian Rosewood vanities. The rich teal color in the glass tile and wall paint relate to the bold use of color in the master bedroom. The custom cabinetry is in keeping with other build-ins throughout this home. When choosing a vanity for your master bath, there are many things to consider. The number of sinks you you’d like, the space available and the materials that best suit your personal style. There are a wide range of options including those that give the illusion of a freestanding sink or custom wood cabinetry. The custom designed vanity pictured here offers maximum storage and a look that is clean and contemporary. A properly lit bathroom combines task-related, accent and ambient lighting; a thoughtful balance of function and style. 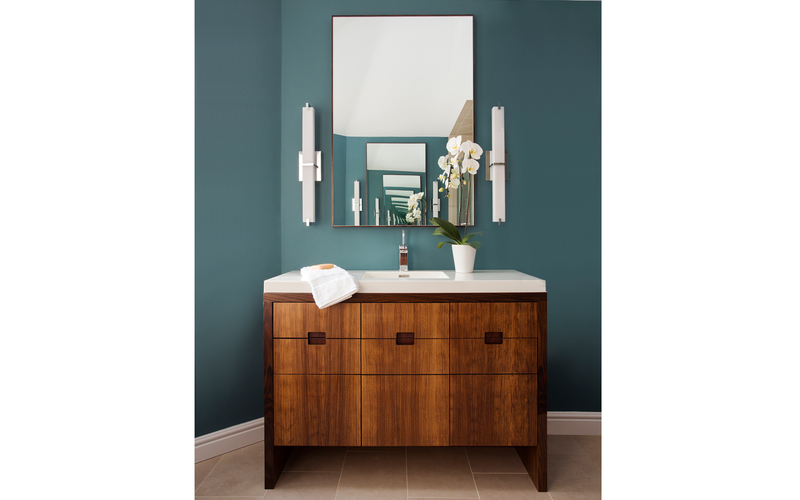 The contemporary sconces, located adjacent to the vanity mirrors’ are place at eye level. They provide beautiful, functional lighting without the shadows created by a fixture located over the mirror. Bathroom fixtures and faucets are available in a variety of styles with a range of finishes and control options. In this bathroom a dated built-in whirlpool tub with tiled stairs and tub-surround is replaced with a beautiful sculptural free standing tub. It is both safer to access and has sleek, clean lines. The shower controls are consistent with the contemporary style of the bathroom as is this beautiful freestanding tub-filler. 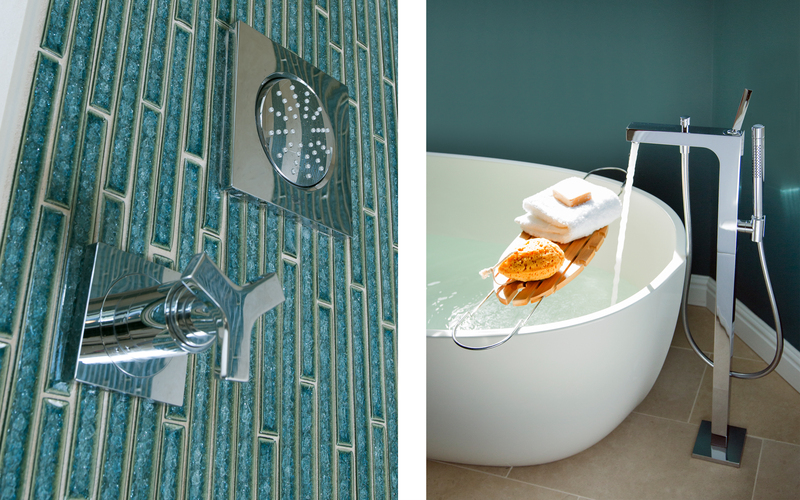 Whether glass, ceramic, porcelain or natural stone, tile provides color, texture and definition in a master bath. There are many styles, sizes and hues from which to choose, it is one of the many creative tools available. Here, rough plumbing is concealed in a narrow wall flanked with glass to give the appearance of a freestanding column. This column, as well as the other shower walls, are all faced with vertical bands of linear glass tile and alternating large-scale, neutral stone tile. This creates a dramatic pattern. 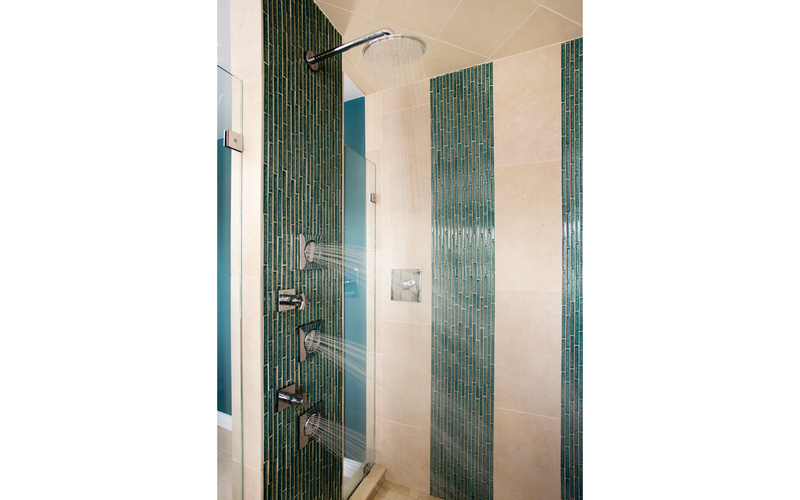 Adding two wall panels of clear glass to the shower makes the space open and airy. A successful project such as this requires a clear understanding of what you want to achieve. With careful planning, and thoughtful, creative collaboration of everyone involved. The result is a beautifully designed master bath. Spa-like features add a bit of luxury to every day, a private oasis right in your own home. Coco Chanel once said: Luxury must be comfortable, otherwise it is not luxury. For more information about bathroom design or the distinctive and inviting spaces designed by Elizabeth Swartz Interiors visit our portfolio or please be in touch. Beautiful work Elizabeth. The tile in the shower gives me a feeling of bamboo the way it is arranged which adds another layer of nature indoors. Thank you for your kind words. I’m so glad you like it.